Anything roasted in pan is one of my lil one's favourite, if its roasted baby potatoes he is the happiest person in the world. Two days back, since i had some leftover cooked baby potatoes after making poori masala,i quicked prepared this super delicious,spicy pan roasted yummy baby potatoes for his snacks as he love potatoes in any form anytime of the day. This quick pan roasted baby potatoes doesnt go for neither onions nor garlic, just chilly powder,salt,cumin powder and roasted gram flour is enough to make this yummy dish. If you have cooked potatoes, this dish takes hardly less than 15minutes and obviously this pan roasted cuties will vanish very quickly too.This dish is going to this month's Magic Mingle#11 as the magic ingredients for this month's is potatoes and cumin seeds.Even you can serve this delicious potatoes as starter, a fantastic crowd pleaser.Sending to my own event Healthy Diet- Healthy Finger Food guest hosted by Preeti of Isingcakes. Heat oil,fry the curry leaves,meanwhile prick the cooked baby potatoes with a fork. Add now the pricked potatoes to the hot oil, fry for few seconds, add immediately the red chilly powder,cumin powder and salt. Cook everything for few minutes in simmer until the potatoes gets well coated with the spice powder. Finally add the roasted gram flour, toss gently everything until the potatoes gets well coated with the flour. Put off the stove and enjoy warm. perfect priya...love to have right now.. I love potatoes...I'm going to steal some from the plate.. I am fan of baby potatoes and chat pat dishes like this is my fav ! Very tempting and looks yum !!!! Delicious pan fried potato I love it Priya. 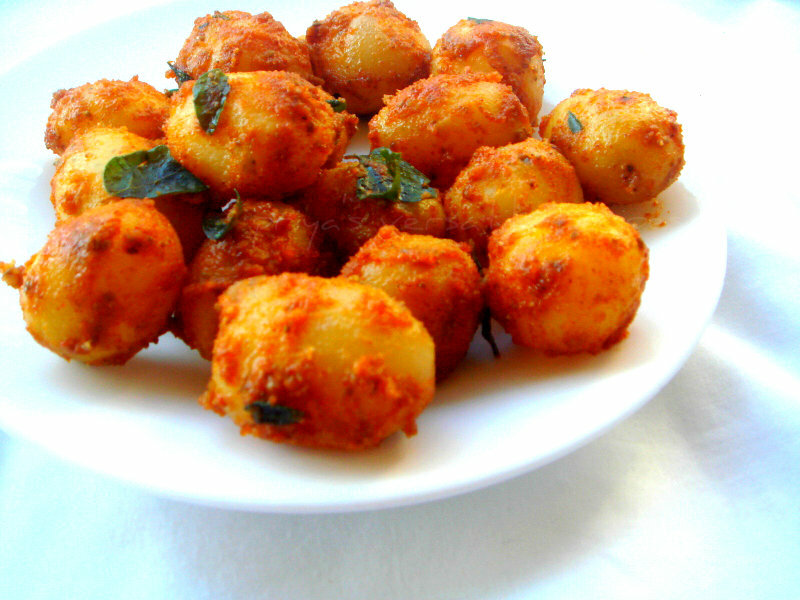 Spicy potatoes,nice recipe and also love your tandoori potatoes you posted a few days back,will try both. Very flavourful, Priya. I have never had or cooked potatoes this way. Always love the baby potatoes,looks delicious. cute looking roasted potatoes, yummy!